Yards go through four different seasons, each with their own personal touches. However, during the fall it is time to wind down the yard and prepare for the harsh winter ahead. But even though the major growing season is coming to a close, you’re still able to give your yard beauty year ’round, even when the temperatures are on the chilly side. Fall is a beautiful season when colors are abundant, and you can use these colors throughout your yard to play it up a bit. Looking for some shade or major landscape accents? Trees and shrubs usually fit the bill, but you should consider a few things when it comes to planting trees in your yard. You want to know what they may look like when the winter rolls around. They should also look beautiful throughout the fall time with beautiful colors. Ash, birch, butternut and hickory trees all have a golden glow in the fall. Dogwood, sophora, sweetgum and hawthorne all have deep shades of reds. Yellowwood and paperback maple give off an orange glow. 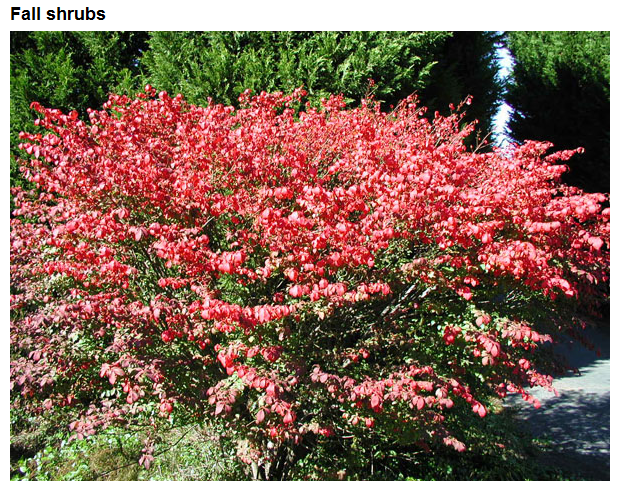 Colorful berries on shrubs can add to the color splash so consider sourwood, flowering crab or mountain ash. Some retain their colored bark into the winter as well as their brightly-colored berries. Perennials are flowers that are able to return every year. Some of the more beautiful flowers that bloom in the fall include helenium, helianthus, turtlehead and aster. You might also choose some natural grasses which have vibrant color, such as ruby grass. Pansies, asters and chrysanthemums are beautiful potted flowers that can go in containers strategically placed around your yard in spots such as near front steps, on patios near seating areas, and alongside pathways. There are dual purposes that you can find in planting vegetables. Not only do they offer so many different colors in the fall but they some also provide nutrition. Kale and cabbages are perfect for the fall months, and there are ornamental flowering varieties available as well as edible ones. Don’t forget the finishing decorative touches. Put out some gourds and pumpkins around the home, or perhaps a wheat shock or Indian corn wreath. This adds some color and also adds to the fall feel of the home. Corn stalks are also a beautiful touch to the home. They can look great on mailboxes or front doors. The fall time is when a lot of people choose to plan their springtime bulb gardens. These bulbs require planting in the fall to bloom in the spring such as tulips and daffodils. You are able to plant these in the same hole as you would with later-blooming perennials such as chrysanthemums; you’ll get flowers in the same area at different times. Is your yard looking forlorn in the fall? Speak with our professionals at Architectural Landscape Design to find out how they can help you boost the appearance of your home and add some color for the fall season ahead of us. And winter can look just as lovely with the right MN landscape design techniques.